The latest addition to the ExamDIff Pro 3.5 beta is a feature that we've wanted to implement for a long time now: balloon messages that display whether or not plug-ins are successful. 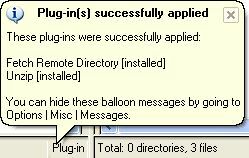 If plug-ins execute successfully, you get a balloon message similar to the one below. If you click on the balloon, or double-click on the Plug-in status bar area, the Options | Plug-ins dialog will pop up, displaying all of the current plug-ins. 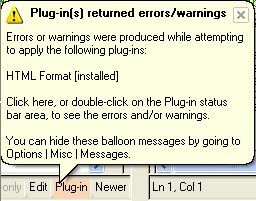 On the other hand, if plug-ins return errors or warnings, you get a slightly different balloon message, like the one below, and the Plug-in status bar area turns pink. If you click on the balloon, or double-click on the pink Plug-in status bar area, the errors or warnings, which ExamDiff Pro obtains through the standard error output of the plug-in (stderr), will be displayed in an external editor. Wellllllll, not so sure about that. I use jacobe to format java files, and it returns a message, which is success message. I've suppressed the balloon, but it's not clear whether ED has a way to know that a message is an error message, not always. I concocted a bad file, and jacobe/ED worked OK, in that the error code was set and the error dialog came up. ExamDiff Pro has no way of knowing what is an error and what isn't - if a plugin returns a stderr message, whether it is really an error or not, ExamDiff Pro interprets that to be an error or warning. To prevent this from happening, many plugins (including Jacobe) have a -quiet option, that I believe will block all success output. Try adding -quiet to Jacobe's arguments, and let us know if this solved your problem. looks like it all goes to stderr, and -quiet works. missed it looking at their docs. what's better is that real errors not only fire the dialog, but also the line at error from jacobe. what could be better?